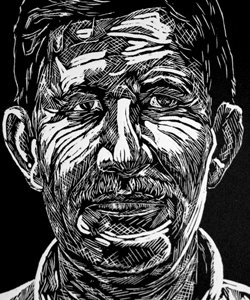 "I don't have a sign up outside my house which says my conscience is for sale"
Carlos started work on the Dole plantations in Valle de Estrella in the 70’s. Shortly afterwards he, like thousands of other banana workers all over Central America, came into contact with Nemagon (DBCP), a pesticide made by Dow Chemicals in the USA. Carlos was made sterile by the chemical. Now known to be a highly carcinogenic product, it has caused numerous health issues for both men and women and in many cases has proven fatal. 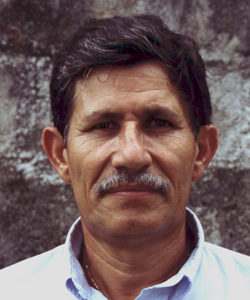 Carlos, through his trade union activities, was involved in the struggle to have Nemagon banned in Costa Rica (in 1979, three years after it was banned in the US). He won a little compensation (if you can be compensated for being made sterile?) which he invested in a pulpería (a wee corner shop) which gave him a wage and which meant he could dedicate his time for free to his trade union activities at SITRAP in Siquirres. As the TU officer for occupational health and the environment he was able to marry both his passions, speaking to workers and community members and inspecting the fish kills at Matina and Pacuare. On the occasions that I went to Costa Rica I stayed with Carlos and I had the pleasure of working with him on my second film, Pura Vida. It couldn't have been made without him. Carlos from around that time was heavily involved in the campaign to stop the unregulated expansion of pineapple production in Costa Rica’s Atlantic Zone so he was 110% so committed to making the film and did everything he possibly could to help score off items on my long wish list of things to film. 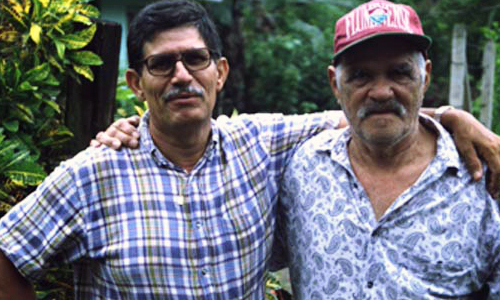 And although the documentary looked at the grim social and environmental impact of the agrochemicals being used to grow bananas and pineapples, Carlos made the work truly joyous and interesting with his generosity of nature and his spontaneity, which meant we never lost an opportunity – we’d stop to film the pineapple booms or crop spraying planes overhead, gate-crash primary schools to film the kids, we’d go by launch down the Río Pacuare or have gratuitous visits to places where I could film kinkajous and sloths because he knew I was an animal lover. I feel so, so privileged to have known Carlos. I’ll keep safe lots of memories of Carlos; his office at SITRAP full of banana paraphernalia from his various campaigning journeys, the house at El Pochote, sitting outside the airport at Bataan watching the crop spraying planes leave, the boat trips on the Pacuare River and riding on horseback to the Reventazón River in the pouring rain, on my husband, Paul’s birthday, and the three of us sitting eating oranges on the banks, all soaking wet…..
Carlos; warm, generous, irreplaceable, principled “luchador” and friend.